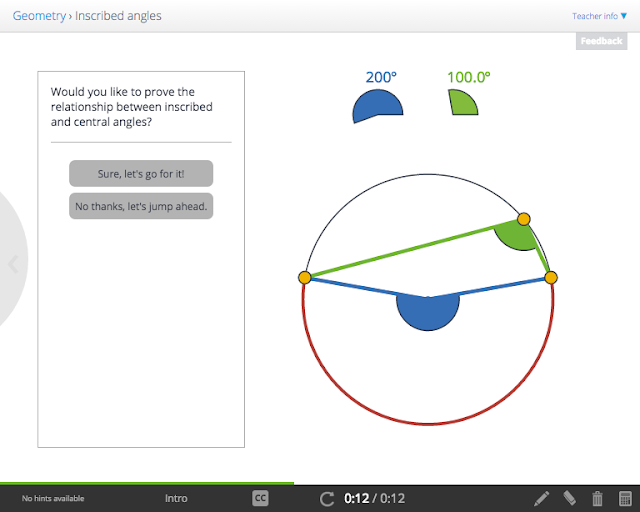 A few weeks ago we launched surveys in AlgebraX and GeometryX, asking students what they thought of the courses, how they compared to others, and what improvements they might suggest. So far, more than 400 students have responded. A sign that we're on the right track was a series of questions on how our courses compare with other massive open online courses (MOOCs), and with Khan Academy, a popular collection of online videos and assessments. A total of 135 students said they had never taken other MOOCs. 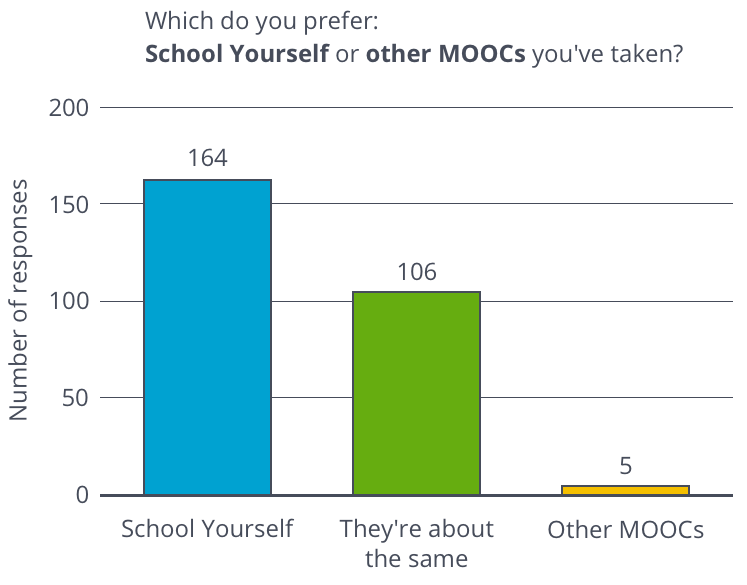 Among those who had, 106 (39%) said they had little preference between School Yourself and other MOOCs. 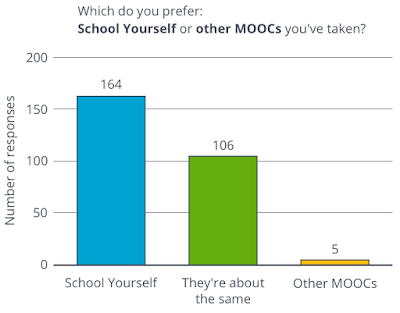 Among those with a preference, 97% preferred School Yourself to other MOOCs. Holy moly! Now might be a good time for other MOOCs to sit up and take notice: students prefer engaging, interactive, and adaptive content. We'll continue to push the envelope, and hopefully online learning will continue to evolve and improve in the coming years. Here at School Yourself, we're big fans of Sal Khan and all that his team is doing for millions of learners around the world. But Khan Academy continues to rely on 10-minute videos of Sal speaking and writing, without letting students interact and make sure they're following along. Khan Academy is a great resource, but we think it can be even better if it adopts our methods of content production and student engagement. A total of 213 students said they had never tried Khan Academy. But students who had appeared to think more highly of Khan Academy than MOOCs. 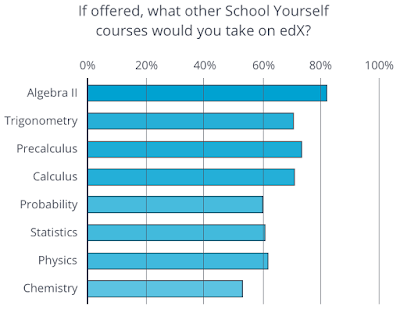 Approximately 33% of students had little preference between School Yourself and Khan Academy. But among students with a preference, 80% preferred School Yourself to Khan Academy. As with MOOCs, we hope Khan Academy evolves into a more interactive, adaptive experience. With Khan's expansive library and School Yourself's adaptive, engaging style, who knows what's possible? 90% of students would recommend AlgebraX and GeometryX to others. Currently, course grades are based entirely on adaptive quizzes after each topic, with ~100 quizzes in each course. 52% of students said having exams (or a final) would help them learn, 14% said they didn't want exams, and the remaining 34% were neutral. 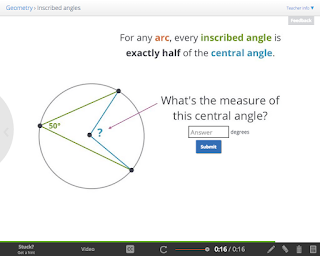 In response to this, our team is looking into adding optional adaptive exams to both AlgebraX and GeometryX. Stay tuned! Students want more lessons on real-world applications of the material. We have a few of these, like using parallel lines and alternate interior angles to estimate the size of the Earth, and how graphs of 2D inequalities are used in machine learning. But including more examples of applications is something we're always thinking about, and we hope to add many more in the near future. Students want more review questions. We're always adding more questions, so we'll see how students feel again in a few months. Some students also asked for more challenge questions, in particular, feeling the courses were too easy overall (77% thought the difficulty was about right, 20% thought they were too easy, and only 3% thought they were too hard). At the moment, the challenge questions are entirely optional for students. If and when edX decides to include grades on certificates, we may look into awarding additional credit to students who master the challenge questions. It looks like our team should get cracking on Algebra II, which won the vote at 82%. Of course, we hope to eventually create courses covering all of these subjects! They all build on one another -- for example, you use trigonometry in physics, and calculus in statistics. The more subjects we add to the School Yourself library, the more paths students can take through the lessons, and the more adaptive and powerful the experience becomes. 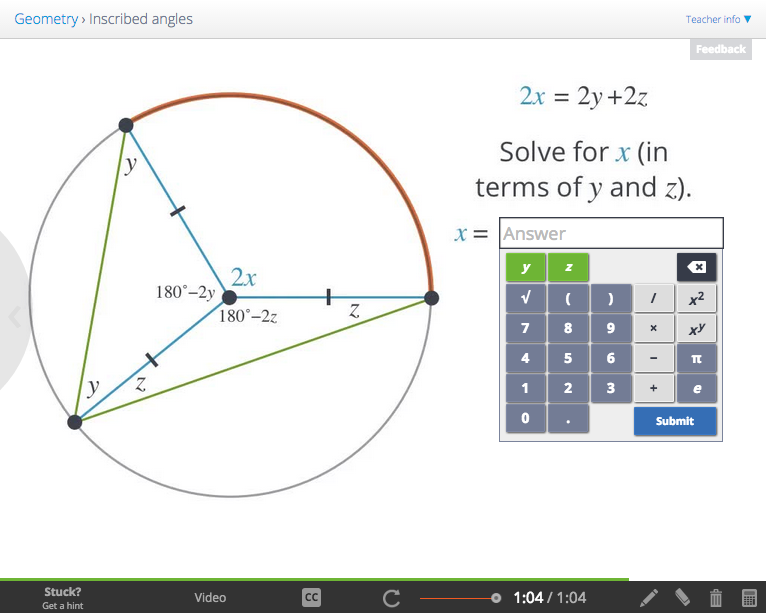 If you've ever taught a math class, then you've probably encountered the following scenario: you're showing the class a cool proof (like why an inscribed angle always has half the measure of its arc), and you get asked: "Will this be on the test?" You're demonstrating how math is a consistent framework and that even the hardest facts are derived from simpler theorems. But your students just aren't interested. And from their perspective, this makes a lot of sense. Students have many demands on their time (some related to education, some not), and they're really just trying to optimize their schedules. And so with our lessons, we tried something a little different. We know students aren't interested in working through proofs all the time. But sometimes they're genuinely curious, or they already passed the quiz and are now returning to see why the rule they memorized actually works. So we try to leave it up to the student to choose: if you want to work through a proof, click here; to just do practice problems, click here instead. After a student sees the rule in action and plays with an interactive, he or she can decide whether to work through a proof or skip ahead. If they opt for the proof, they'll work with general angles and prove it for themselves. Otherwise, practice problems it is! While it's nice that we give students the choice, we're really hoping they'll elect to work through the proof. They'll get more experience with geometric proofs, get more practice with algebra, and convince themselves that the rule truly works. So how many students decide to work through the proof? 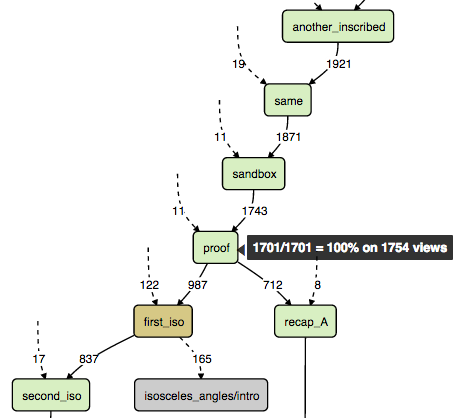 Using our analytics dashboard (which comes with our authoring tool, QuickBranch, for you content authors out there), we found that of the 1701 students who made it to this point in the lesson, 987 (or 58% of them) decided to work through the proof. And of those, 779 (~78%) made it all the way through the proof. We found similar rates in other lessons as well, like the Pythagorean theorem. More often than not, in our self-paced learning environment, students will choose to work through the proof. When they're asking "Will this be on the test?," it's not that students don't care or don't want to learn. It's that their time is limited, and they're trying to optimize. If you free them from these constraints, and let them come back to the proof when they feel motivated or incentivized to really learn it, they'll choose to do so. So when it comes to material that won't be on the test, trust your students and give them the choice. They may surprise you.